You know, it’s really hard to pick. It’s especially hard since all of my knitting books are in a storage locker a mile away from me right now! The one that comes to mind off-hand is Favorite Socks by Interweave Knits or Folk Socks by Nancy Bush. Knitting Vintage Socks is a fun one, too, but it’s been a while since I’ve looked through my copy. Of course, my favorite thing to do is buy a pattern from Anne Hanson’s website knitspot.com. The patterns I’ve bought from her are best for their simple stitch pattern that is easy to memorize, but entertaining enough to keep me going. I pretty much use the pattern to get started and once I’ve memorized the stitch pattern, I never need to look at the pattern again! Um. I don’t really use any of my sock books, so I don’t have a favorite. 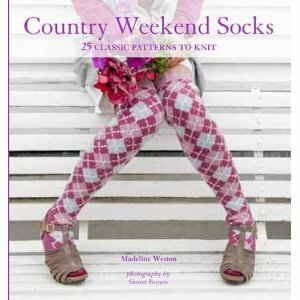 My favorite sock book would definitely be Sensational Knitted Socks by Charlene Schurch. It’s jam-packed with goodness and very smart – formulas for all feet, great patterns and tips, then only sock book you’ll ever need in my opinion. I’m with Paige – great book and well-written, too.